My Very First Blog: Can You Spend A Whole Day At Shopping Malls? I will be so utterly bored and tired from so many hours there. Max. is maybe 3-4 hours and I dislike over crowded malls where there's just a sea of people. I so agree with your Aussie friend...just that over here's lacking good parks and places outdoors within a short driving distance from the city. I DISLIKE walking aimlessly in mall( i.e shopping to most of you) unless I need a particular item or an arranged venue to meet up with friends. I DISLIKE movies at cineplexes because I will fall asleep. I DISLIKE eating in the mall because they are priced higher and I can eat the same, if not better food, at a nearby coffeshop. So, what does that lead to ...am I a BORING zzzz person ? I like playing and learning the piano (PBY method)though..so can you give me FREE lessons as part of your charity drives to give and share with your fellow blogger or should I called myself "commenter" ??? Climate is different! 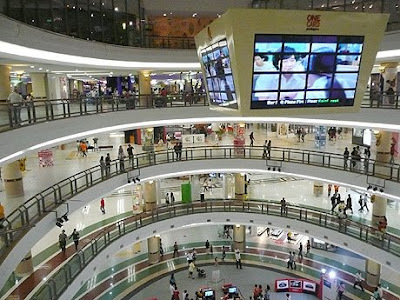 Malaysia is too warm, so people head to air-conditioned shopping malls. When I was in California, I liked the winter sun very much! I veli anti-social and poor so we usually stay home on the weekends, I cook the meals, watch pirated DVDs or lousy reruns on Astro, and if we do leave the house, we go to the playground near our place for my son to run around. The furthest we'd go is to the beach or to the recreational park. Free, healthy and plenty of fresh air. Wat2do, no $$$ to spend it on shopping malls mah so have to do cheap things lor. Besides, what's so fun about going through the jams heading to shopping malls, going round and round searching for parking and then wandering around with huge crowds and some more have to queue up for seats at restaurants. Ceh. Waste of time & $$$. Yes, yes and yes!! Gotta run but will be back to read the post. Happy Friday, Foong. u must add at 7.30pm, you noticed a mysterious stare from two strangers who happens to look like ethan and his mommy who also happens to be in MPH browsing children's book, sporting this guy who looks like foong! LOL.. one day I am bound to bump into you foong! Weather here is so hot, so people tend to go to shopping malls for the free air con. Wow a whole day in a shopping mall. Yea my friends love that. Out with them and the itinerary would be like yours but I always end up getting drained before dinner and a massive headache because when you're in a shopping mall all day, you really take much less water compared to when you're home. 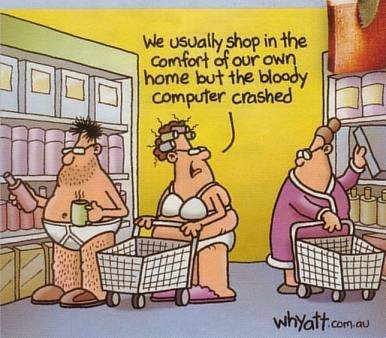 I prefer to spend my weekends at home unless I have things to buy then I will go shopping, else it is cheaper at home. Watching movies are preferably done in the weekdays. Oh yes and I agree with xin, shopping in the weekdays is better. cheaper parking and no crowds :D.
The spirit is willing but the wallet is weak. Hahaha, I oso watch pirated DVDs mah!! for my age, i beh tahan la.. whole day in shopping mall not my cup of tea la.. so i want to taibik to u.. u geng..i lark..not night owl also..
gone are the days that i could walk and walk for hours.. now? darn.. cannot walk so much la. back pain, leg pain, ankle pain.. apa pun pain!! Me...nah I can't. Unless if my wife wants to. Hahaha :D But nope...I can't walk for the whole day. I would rather sleep. By the way bro...how come your blog is infected by malware again? I the maximum I could be in shopping complexes is around 5 to 6 hours max including watching movie and makan lar. Haha :D If more than that, I would feel so damn tired already. Long answer: Back in my college going days, it used to be early bird movie + lunch + wandering = half a day. I miss the days when I can catch the first screening of the first day of opening. But now I go on Wednesday nights the following week because I'm cheap like that. Now I last about 4 hours max before "admitting defeat" and going home. These days I find myself going to malls simply to go around collecting skincare and cosmetic samples, haha. I mostly spend my weekends at home catching up on talk shows. oh but i can spend a day in blogging lols what yah think? I think i'm OK with that there are plans to do so like yours... if aimless loitering there, it'll be a real bore! If eat, watch movie and sing k I can. But if just walk to shop (especially NOT buy my things one) then I definitely can't. It takes less than 3 hours to kill me that way. Haha. used to. but not anymore. 1U, yes! One of my fav malls. Perhaps we've passed each other by without knowing, eh? You think? That's one itinerary I sure can fit into esp rounding it up with karaoke. Yeah lah, finding a parking lot is horrendous. There was once we just left after not being able to find a space after 1130am. You said, For the ladies, it's usually gossips and more gossips. I protest! As if guys don't gossip. Don't bluff.. LOL! Thanks for sharing your weekend at the mall, Foong. Fun to read. Foong, btw, I just left this comment at Mei Teng's. Bringing it here in case you miss it. hehe..
Yep, found one of these three items in a Chinese restaurant in a 5-star hotel! Oh well.. life goes on..
course I can! it's in the asian blood foong! hahaha! I love malling before. But when I learned to blog, I seldom go to the mall since. Mall got free aircon mah! Like the cartoons! LMAO! i can't :) i can't even stand several hours in the mall, i would prefer to be in the ocean or in the mountains, going for a hike or ride the waves. For quite some time, the author of this blog has been copying the work of others and passing it off as his own. This is known as plagiarism. It is not only immoral. It is also an illegal, criminal act. When confronted about this, Anton chose the coward's way out. Instead of responding, apologizing or otherwise expressing some sort of remorse, he skulked away and started another blog. I thought you'd want to know this, and would want to verify your own archives to ensure he hasn't used some of your own work as well. I'd recommend checking out the service at http://www.copyscape.com to ensure your own material has not been stolen in a similar manner. I invite you to contact me via my blog, Written Inc., if you would like to discuss this further. I can see you have a strong interest in blogging and writing, and are vying for the Malaysian Blog Award. It tells me that you take your writing and posts seriously. I am the blogger who your friend Anton stole from. He lifted several of my posts and pasted them on his site while pretending to have written them. Shameful. I wanted to humanize this issue by leaving you a comment supporting the information Carmi has left here as well. Anton's blog has been shut down. He tried to start up another one which only lasted a couple of hourse because my blog friends are keeping an eye on his illegal and immoral behaviour. Please be careful...make sure he doesn't do this to you. I can. And have done it numerous times but of course not in KL because you can always come back tomorrow! Well, if I have lots of money, I can surely spend the whole day there. spend whole day if I got the money no problem! wow. ur $$ spent for the whole day is enough for me to live for a week. I used to spend my whole day in the mall 'shopping' only. But not anymore. I prefer doing what your Australian friend said. Hiking, climbing, go kart... any outdoor activities but but cannot find kaki le. There are lots of shopping malls in SG but I would not spend a day in one of them. but it depends la.. if im like at outstation... or hanging out with friends.. i dont mind.. hehe..
Hahah funny cartoon! Yeah I think I can spend like a day in the mall but not shopping the whole day! mei teng, I also don't like crowded malls. But 1Utama is still OK, unlike Mid Valley! Of course shopping during the weekdays are better, as there are no queues and you can even try on your clothes as long as you want without worrying that someone is waiting for you to finish trying on your clothes. For me, I can still spend a whole day at the mall provided there are things to do and I'm with friends. Even without shopping, I can spend the whole day sitting at a cafe and chit chat! bura 10, I also dislike walking aimlessly at the mall, normally I go with the motive to buy something or to meet up with someone. You will sleep in cineplexes? Why? I love going to the cinema! Eating at the restaurants in the mall is definitely more expensive, but sometimes it's OK to enjoy eating there. Coffeeshops can be boring if you go there everyday! haha! lina, why no more now? Is it because everyday you spend your time in Mid Valley or the Gardens? Haha! foong speaks her mind, haha! You have got a point there. Why go shopping malls during the weekend and compete with everyone else for parking space and empty tables at restaurants? Go during the weekdays and you can avoid all these problems! happysurfer,happy Friday! Although this reply should be last Friday's! LOL! Too busy so only reply now! merryn, oh so you always go 1Utama also? Next time I must go MPH to see if I can spot you both. I definitely will be able to spot Ethan. Haha! ladyviral, true shopping during the weekdays are definitely better with less crowds and less queues and cheaper parking. But most of my friends are not free during weekdays, so it has to be weekend for me. mariuca, I prefer to watch movies in the cinema. I like the darkness and the big screen! At home, always get distracted when watching movies on TV! tekkaus, my blog infected with malware again? I did not know about that! No idea why! Absolutely no for me. I only shop when I have something to buy. But I do window shop quite a lot when traveling because you have more new things to see in overseas.